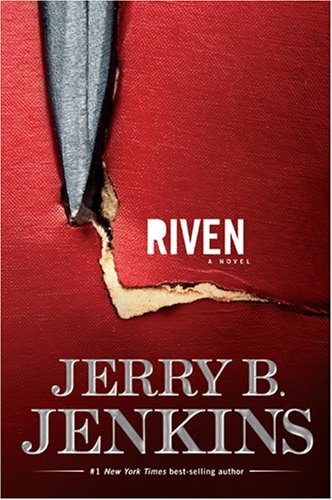 I'm "helping" Carrie with the blogging again this week, this time reviewing the mainstream Christian novel Riven, by Jerry B. Jenkins. Some friends of ours loved this book and loaned us their copy, which I spent a few days with. The author, who's written twenty other bestselling Christian fiction titles, describes this work as "the novel I've always wanted to write and is unlike anything I've ever written". I was intrigued by that, and, having now read the book, agree wholeheartedly. This is one of the most unusual novels I've seen in a long time. The writing style Jenkins uses in this book is completely different from what we're used to in contemporary novels. These days, the "popular" novels are those that keep you glued to your seat from beginning to end with plot twists, gripping action, and intensity. This book is different. The storyline is not fast-paced and action-packed. In fact, after having read the first 300 pages, it felt like the plot was only just beginning, and everything up to that point had been focused on character development. In reading this style of writing, though, you find yourself becoming much more intimately involved in the (very complex) personalities and emotions of the individual characters. You feel like you've walked with them, and know their joys and sorrows. You can empathize with their thoughts and reactions as though they were real people -- good friends, at that. At 500+ pages long, you're given plenty of time to identify with the characters. And when an unexpected drama is unleashed on their lives, it is incredibly powerful because of what has come before it. Worlds are transformed, lives are changed, and it's related in a way that reaches deep into your soul. Without giving details away as to the actual content and plot, I will say that this book largely revolves around the somber, darker side of human nature. Actually, it reminded me of Dickens' writing in many places. Revealing the inner conflict and struggles of man, through a gradually-unfolding story that is presented in a measured, steady tone. A unique book indeed, and one that is eye-opening in many ways. This sounds very interesting and very much like the type of book I like. I'll have to give it a go sometime! I really liked this book. I think this is Jenkins best book yet. The conclusion is like none other. This sounds wonderful to me...I so much prefer character-driven to plot-driven novels. I'm adding it to my ever-growing TBR list. Thanks!